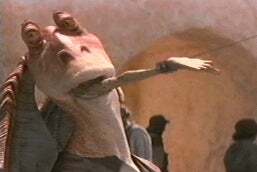 I have no idea what you all did over the Thanksgiving holiday, but I began a journey that I never thought would happen - I watched the Star Wars prequels for the first time. So, here is my question to you all, should you choose to answer: Who is your favorite and least favorite Star Wars character in the movies so far? Least fave: Anikin before he goes evil. OMG KID LEARN TO FRACKING ACT!!! Your turn! Or not, hey, it’s an open thread; talk about whatever! !